Call 888-LOG-GUYS, the #1 company in log home restoration! 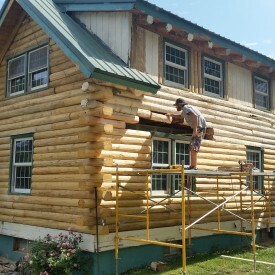 There are a few other things we can do for you, too, such as log home repair and log home chinking and caulking. 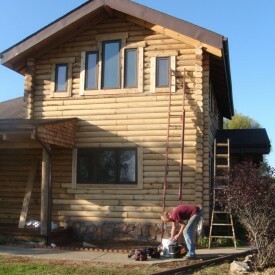 We also specialize in log home improvement and log home maintenance. No matter what your log home care needs are, we are the best in the business to make sure your log home or log cabin in the Crossville TN area is safe, secure, stable, and beautiful. There is nothing quite like a log home, and we know how important it is for you to keep it in the best condition possible. 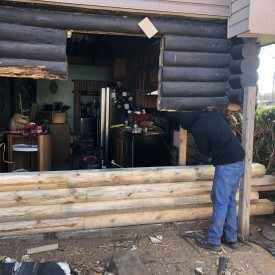 We use media blasting (glass, walnut, sand, and corn cob blasting) to strip the old, peeling stain off of your log home and then sand the logs down. We then clean the logs with a borate treatment and apply chinking or caulking in between each log. Finally, the work is done after we have applied the best stain product on your log home or log cabin to make it look fantastic! 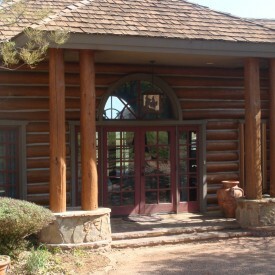 There is no other company that will restore your log home better than 888-LOG-GUYS. 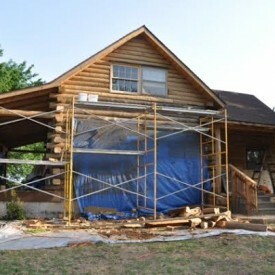 If you want the proof, then hire us to see for yourself why we are the best in the log home restoration business! If you have logs that need to be fixed due to log rot, burrowing bugs and insects, or severe weather, then you have found the right company to get the job done. 888-LOG-GUYS has many years of experience repairing or replacing logs due to mild to severe damage. You can rest assured that your home will be transformed back to great condition after our crew fixes each log in need of repair. Don’t delay! Call our number or ask for a quote online! If there are any gaps in between your logs, seal them with chinking or caulking applied by 888-LOG-GUYS. An energy seal will prevent bugs or insects from invading your log home. It will stop water from leaking into your log home. It will keep air drafts away from cracks around doors and windows. If you have any of those problems, ask your log home chinking and caulking company to get some of that white stuff in between your logs. We want to help you keep your log home safe and comfortable. If you have ideas on how to improve your log home and increase your log home’s value, share those ideas with 888-LOG-GUYS! We will discuss with you how to best complete your project, and our crew’s carpentry skills will make those dreams a reality. Would you like a log staircase or a log railing? Are you thinking of an outside deck, porch, or patio? 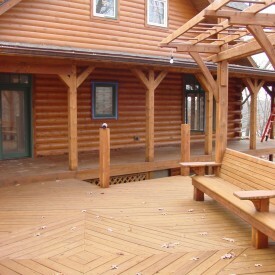 No matter your thoughts, let us know what you would like to add onto your log home or log cabin, and we will help you! Attention! It may be time for your log home or log cabin to get cleaned for its proper log home maintenance! If you have questions on when your log home should be cleaned or how it should be cleaned, call us or ask us your questions online! Whether you have used our services before or not, once you become a client, we are always here for you to help you with your log home care. Our maintenance services will save you time and save you money, so don’t wait! Contact us, and we will take care of your log home so that you don’t have to!